As this is my first blog post, and I rarely get a chance to talk about them (at least not in a good light!) I will start with an introduction to the wonderful Land of the Fanns team. Most recently Joanne Dungate has joined the team as the Finance and Admin Officer. Along with getting familiar with the inner workings of the Land of the Fanns finances, Jo is passionate about green spaces and the community engaging in their local area. Other members of the team are Deborah Brady, Heritage Engagement Officer and Aisling Woodhead, Environment Engagement Officer. As for myself I began work as the Land of the Fanns Scheme Manager in August last year. My next piece is a shameless plug for our Community Action Fund. If you are you looking for funding for your next project, the Land of the Fanns Community Action Fund could be for you! The Fund was launched in February this year, so if you have a project in mind please us know about it. The grants programme is open to schools, community groups, residents associations, scout groups, friends groups and social clubs within and surrounding the Land of the Fanns project area, for projects that compliment the wider scheme and meet some of our main objectives and vision. You may be thinking of planting an orchard or hedgerow, making bird boxes, creating an exhibition about your local heritage, researching or restoring an old building. You may be planning on producing an interpretation leaflet, holding a heritage themed event, digging a wildlife pond or creating a wildlife habitat. Perhaps your group wants to build a bird hide, board walk or do an archaeological dig. If you’re a school, you may want to create a school wildlife garden or you may be a group that wants to receive training or equipment to help restore, manage or engage with your local environment and heritage, or even organize heritage themed arts and drama events. Whatever your idea, we want to hear from you. £15,000 will be available through each round of the Community Action Fund to deliver projects of up to £5,000. There will be five rounds between now and 2021. The current round closes on 31st July, so there’s still plenty of time to get your application in. If you miss it, there’ll be another round starting in September! For more information on the Community Action Fund and how to apply, head to the community grants page. We continue to work with our partners, Museum of London Archaeology, to develop an exciting programme of heritage projects. Look out for updates on the Time Truck that will hopefully be on the road in autumn this year at the Orsett Show and Thames Chase Apple Day. This mobile event space and classroom will be bringing archaeological finds and artefacts to a location near you! We will also be launching our Built Heritage learning programme, engaging communities with their local historic buildings in early 2019. Land of the Fanns Book – Sue Smith, our local heritage expert, has now completed the first stage in producing a Land of the Fanns book. The detailed synopsis, which is a mine of historical and archaeological information about the Land of the Fanns, will help inform our heritage projects and build on the content which will ultimately go into a Land of the Fanns Book, the cornerstone of the project! Interpretation – We hosted a fantastic workshop in February with site managers and volunteers from eight different sites across the Land of the Fanns including Davy Down & Langdon Hills in Thurrock, Bedfords Park in Havering, Thames Chase Forest Centre, High House in Purfleet, Forestry Commission’s Pages Wood, Eastbrookend and Valence House in Barking & Dagenham. The day was lead by interpretation specialists, TellTale, to help develop individual interpretation plans for these key sites. Thurrock’s Next Top Boss – The Land of the Fanns team have been successfully working with students from Ormiston Park Academy on an interpretation project at Davy Down as part of “Thurrock’s Next Top Boss”. The students got some first-hand experience of developing interpretation from an afternoon with TellTale. One group, “Pump Up Project”, went through to the Next Top Boss Awards with Molly Anne-Hughes being selected as the individual winner. Photography workshops – we are currently promoting free photography workshops over the coming summer. To find out more please click here. River catchments – Thanks to funding from Thames Water, Environment Agency, Havering Council and of course HLF we are developing some great river restoration projects along the Rivers Rom, Ingrebourne and Mardyke. The Land of the Fanns team are working in partnership with the Environment Agency, Forestry Commission, YMCA, Havering Wildlife Project, Roding, Beam & Ingrebourne Catchment Partnership and South Essex Catchment Partnership, Havering and Barking & Dagenham Council and Thames21 to deliver improvements for wildlife, access and interpretation along these rivers. 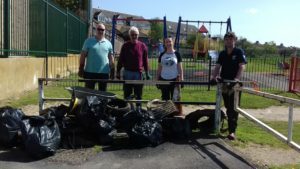 Most recently Thames21 held a river clean up on the River Rom at Grenfell Park. Walking the Fanns & Re-discovering the lost Fens – We are developing new walking routes and leaflets with the Thames Chase walking group. Remember, Thames Chase Volunteers lead a guided walk on the last Friday each month, look out for more details on the Thames Chase website. Land of the Fanns Talks – Over the past couple of months the Land of the Fanns team have been busy spreading the word about the project! 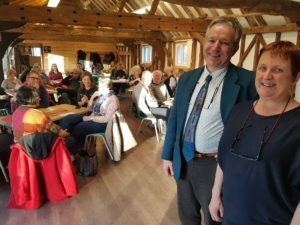 We have already visited the High House Community Group, Heritage Forum in Upminster Chapel, Friends of Ingrebourne, Friends of Bedfords Park, Friends of Rise Park, Friends of Langdon and the Nelmes WI. Please get in touch if you would like us to come and visit your group. Finally I would like to thank all our stakeholders for supporting the projects so far. For further updates, please like our pages on social media including Facebook, Twitter & Instagram.